The party season is upon us, and with my works Christmas do looming this Saturday there is talk of all things sparkly in the world of fashion. I’ve decided to base tonights feature on sequins as they can be a tricky one to style. Over dress them and you run the risk of looking like you’re wrapped in tin foil. Let’s just leave the turkeys to that, shall we?! Rather than the usual one garment, two looks, I’ve done two completely different outfits altogether, purely because I didn’t come across anything I thought could be taken from day to night. For the first look, I’ve chosen a simple black jumper with sequin detail as I think it’s a really night, delicate way to incorporate sequins into your outfit. This would go great with some indigo skinny jeans and a leather waistcoat. It would also look fab with some heels, but I wanted to keep this really casual so I’ve gone for some Converse style trainers in an amazing metallic gold finish. 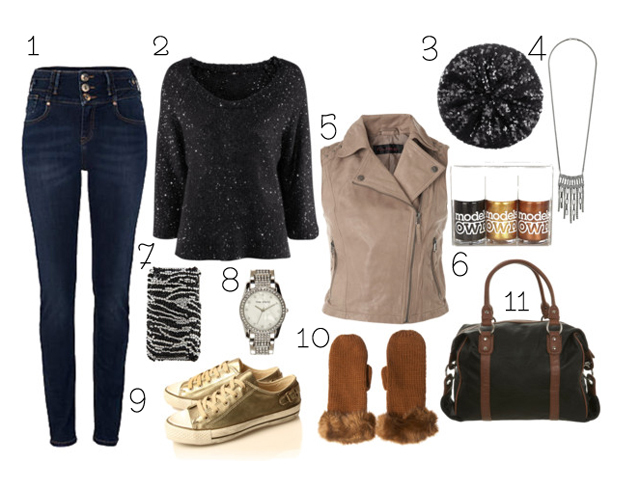 I’d accessorise with a sequin beanie for a little more sparkle, and some fur cuffed gloves. I’d keep jewellery fairly simple, a long silver chain and a simple watch is enough, but I’d make a statement with the nails with some metallic shades. The bag is a simple black oversized one, as to not over complicate things, but if you wanted an extra splash of bling, go for a rhinestone covered phone case to complete the look. For a night out, the sequins can be multiplied, but still need to be styled well to really look their best. They can be so overly done and I’ve seen so many victims of sequin overload. In the evening, my general rule is the more sequins, the less accessories. I’ve chosen this absolutely gorgeous dress, which is pretty much covered in sequins, so with this I’d wear a simple leather biker jacket, oversize clutch and platform shoe boots in plain black. The only other accessories I’d add would be a cocktail ring and some cute little lace ankle socks to soften the shoes. If you didn’t want to go bare legged, swap the socks for some black opaque tights and you will still look just as good! I’d also keep make up simple. A fresh face, a slick of mascara and a sweep of plum lipstick is enough. Then I’d add some nail polish in a matching colour. What do you think? Will you be donning the sequins this party season? What will you be wearing for all your Christmas parties? I’ve got a day off tomorrow so I’ll be getting my hair cut then putting my Christmas tree up! Super excited that its December tomorrow. Advent calendars at the ready! I absolutely love the dress & boots in the second look. Sequins are such a must around Christmas, I've got a vintage black & silver sequin dress & a gold sequin flapper top which should do me well over the party season.